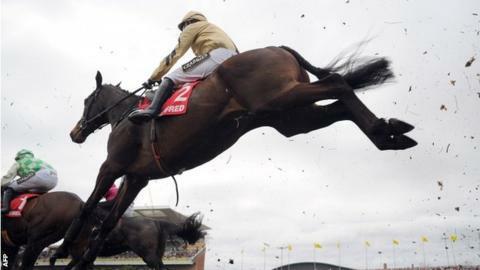 Boston Bob won the Melling Chase on day two of the Grand National meeting at Aintree. Paul Townend rode the 5-1 chance to victory for trainer Willie Mullins in the main race of Friday's action. Nick Schofield rode Rolling Aces into second with Tom Scudamore and Ballynagour further back in third. Ma Filleule's victory in the Topham Chase gave the combination of jockey Barry Geraghty and trainer Nicky Henderson a hat-trick of wins. Mullins' hurdler Boston Bob has had mixed results over fences during the last couple of seasons, but ran well when sixth in the Ryanair Chase at last month's Cheltenham Festival. Things looked to be happening a little too quickly for the nine-year-old in the early stages of this strongly-run two-and-a-half-mile contest, but Townend timed his race well, launching Boston Bob with a challenge in the straight. His mount responded between the second last and the final obstacle, bringing him from seventh place to a narrow lead. He landed a little flat-footed after jumping the fence, giving a chance to both Rolling Aces and Ballynagour, but Boston Bob recovered to beat the former by three-and-a-quarter lengths. Townend said: "I thought I was in trouble a bit at the third-last, but he pulled out plenty. I know he's had two falls but he's actually a very good jumper, and he deserved that." The Henderson - Geraghty combination enjoyed a treble on the day as Ma Filleule won over the Grand National fences to claim the Topham Chase. "Did we see a future Cheltenham Gold Cup champion on day two at Aintree in Holywell? Quite possibly. "The Mildmay Chase winner was strikingly impressive as he followed up a success at March's Cheltenham Festival, achieving a runaway, 10-length decision in a very good time. "Holywell is not a classic, big steeplechasing type, but more terrier-like, a horse that's relentless gallop gets the job done, quietly and efficiently, in a not dissimilar manner to Bobs Worth, and he's a Gold Cup winner. "And a glance at this race's history shows it's been won by some 'proper' horses such as Bregawn, Burrough Hill Lad, Bradbury Star, Monsieur Le Cure, and more recently, Silviniaco Conti and Dynaste." Having won the opening race with Josses Hill in the Novices' Hurdle, and then with Beat That in the Sefton Novices Hurdle later in the day, trainer Henderson and jockey Geraghty enjoyed victory with the 9-1 shot in the wide-open handicap. Henderson's charge jumped impeccably for much of the race, taking a share of the lead after jumping the Canal Turn. She was alongside favourite Double Ross jumping the second last, but left him and the rest of her rivals behind and victory was virtually assured as she jumped the last and came home with eight lengths in hand over second-placed Bennys Mist, Eastlake and Tatenen in third and fourth respectively. Henderson said: "She enjoyed that. I hoped she would. She seemed very good at home. She was a bit careful the first time and she had another practice on Tuesday just to make sure. "I was a bit worried she might get outpaced early on, but she managed to hold her place." Cheltenham Festival runner-up Josses Hill beat Sgt Reckless King of The Picts into second and third respectively in the Top Novices' Hurdle. Tony McCoy rode 7-2 chance Holywell to an impressive victory in the Mildmay Novices' Chase. Jonjo O'Neill's hurdler, who won at Catterick and Doncaster before striking in handicap company at the Cheltenham Festival for the second time, beat Don Cossack into second and Wonderful Charm into third. Geraghty and Henderson had their third win of the day in the Sefton Novices' Hurdle when Beat That bested second-placed Cole Harden and Seeyouatmidnight in third. Clondaw Kaempfer won the Alder Hay Handicap Hurdle, with Avispa taking the final race of the day, the Mares Flat Race.